On a smooth surface background, at the bottom, appears a sheathing of three flattened acanthus leaves; from the top of the centre leaf rises a female figure in sleeveless, belted double-layer chiton. In each hand she clutches the stalks of foliate stems rising from behind secondary acanthus leaves either side of her feet. These stems (as can be seen more clearly on the following example) twist up in foliage and tendrils to a pomegranate and rosette above her head; a putto runs to the left, placing a foot on each one of these, and grasps a tendril in each hand as they twist further up the surface. The style of the truncated figure springing from the foliage is quite suggestive of the small figure doing likewise between two griffins in a Severan or later Second Century(?) frieze and architrave fragment from the Farnese Collection(?) and in Naples1. The motive is found at an earlier, Antonine period in stucco in the delicate decoration in a lunette of the tomb beneath the Church of S. Sebastiano over the catacombs outside Rome2. A female figure stands in an acanthus calix and holds foliate tendrils which scroll delicately away from the figure and over the surface. From the San Sebastiano stucci we can imagine such work tracing back in Roman graphic art through the grotteschi of the "Cassa di Livia" on the Palatine to the art paralleled in the so-called Campana architectural terracottas3 . Robert Cöhon (loc. cit.) concludes that V69 and V70 were originally set back to back and forming a solid slab of pavonazetto marble; the slab was probably split in half in the 18th century so that both reliefs could be seen together mounted on a wall; they may have originally formed a pilaster, screen wall of table support. 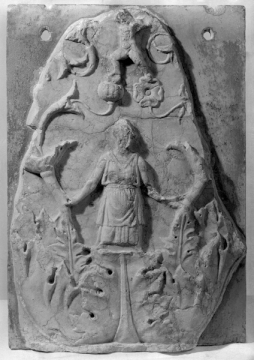 He comments that each relief portrays a goddess arising from an acanthus calyx; the goddess can be identified as Venus (Eros above her) who is portrayed in her role as vegatal deity. He concludes that the style of the reliefs dates them to the Augustan or Titian period and that they were inspired by the Ara Pacis. 1 V. Spinazzola, Le Arti Decorative in Pompei e nel Museo Nazionale di Napoli, Milan, 1928, pl. 20. 2 P. Ducati, L'Arte in Roma dalle origine al sec VIII, Bologna, 1938, plate CCVI, 2. 3 Compare Ducati, L'Arte in Roma, pl. LXXXVI f, and, in the Soane collection Terracottas, Vermeule nos. 467, 469. Robert Cohon, The Soane Reliefs: A Goddess in a Calyx, the Ara Pacis in Pavonazetto, Sonderdruck aus Mitteilungen des DAI, Römische Abteilung, 101, 1994, pp. 87-95.